It’s so cold up here in Canada. I’m stuck here for work on an important course away from home and any whitewater. I can hear the wind blowing against my hotel window. It feels like a vast and barren wasteland. My boogers are freezing my nostrils closed and I have to breathe out of my mouth. The good news is that there are still fun things to do in the cold, like snowshoeing, watching ice racing, snowmobiling and sitting out on the frozen lake in lawn chairs drinking beer. We’ve also made some road trips into the big city! It won’t be long now, we’re almost a month away from MACKfest (http://www.mackfest.ca), and then the festivals, events and water will pick up. Snickers is really excited to get back in the water. No Snickers! 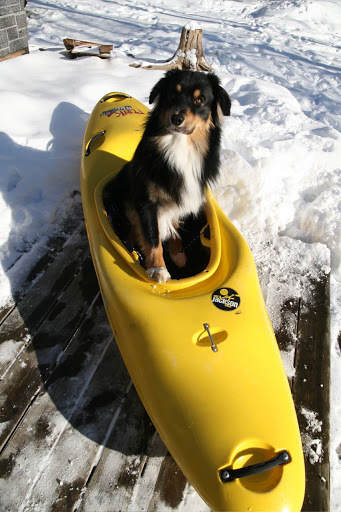 You can’t paddle today, it’s too cold!